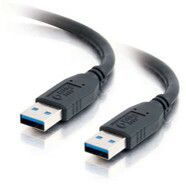 NT USB 3.0 A/B 36"
Newer Technology USB 3.0 A/B Premium Quality Cable. Gold-plated connection. Backwards compatible with USB 2.0 devices 36" . 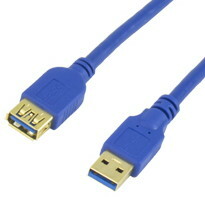 36" USB 2.0 A to 5 Pin Mini B Cable for digital cameras, cellphones, hard drives. USB 2.0 A to 5 Pin Mini B Cable 1 Meter - Auxiliary USB "Y" Power Design for external hard drives. USB 2.0 A to 5 Pin Mini 12"
USB 2.0 A to 5 Pin Mini B Cable 12". Connects your cell phone, hard drive, and other equipment. 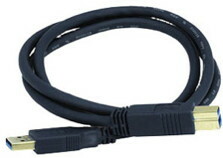 USB 2.0 A to B Peripheral Cable 6ft Used for connecting USB 2.0 devices to your computer. USB 3.0 Extension Cable 36"
0.9 Meter (36") USB 3.0 A/A (male/female) Extension Cable. Backward compatible with previous versions of USB. USB 3.0 Extension Cable 72"
1.8 Meter (72") USB 3.0 A/A (male/female) Extension Cable. Backward compatible with previous versions of USB. USB A to B Cable 36"
USB 3.0 Micro-B to dual USB 3.0 cable�Auxiliary USB "Y" cable for external hard drives. Black Color.